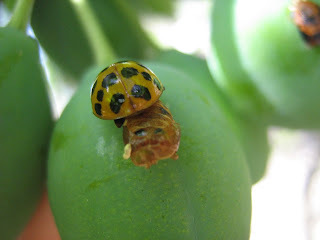 I know I already posted about this but Katherine had mentioned she had never seen ladybugs in their "wrinkly" stage before and I had never seen them right when they have come out of that pupal stage before, so I thought it was interesting enough to show more. ;-) Here is the pic I posted last week when we found them at this stage. 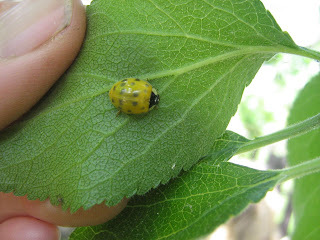 And here is the same pupal case yesterday, but empty now, with a new ladybug underneath the leaf. When they come out of their pupal case they are light yellow and they look wet and soft. It really is incredible to see. E was so excited as he found each one. This one has been out for awhile because you can see its shell is orange now, getting more red. Last night we were looking at the shell-like remainder of the pupal case in E's magnifying kit and he said to me, "It's way more cool to actually see them in real instead of just in a book." I had to agree. After reading more about the ladybug's metamorphosis we will be watching to see if we can find one going from larvae to pupa stage. 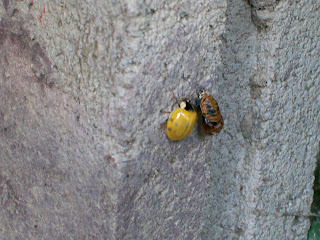 This one is newly emerged and you can see the colour of it well. E found this one and wanted to take a pic of it. 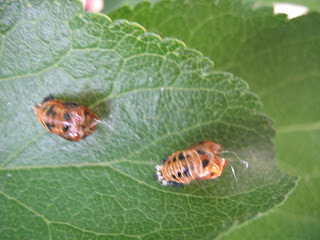 Now, let's hope that they get to work again and start eating all the aphids on my roses. Very cool, Heather! It's always best when we get to see things firsthand rather than just from books. 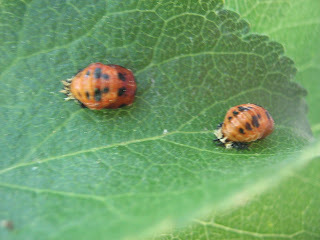 Hope you've got the aphids subdued and that some of your ladybug population will find their way to my garden!